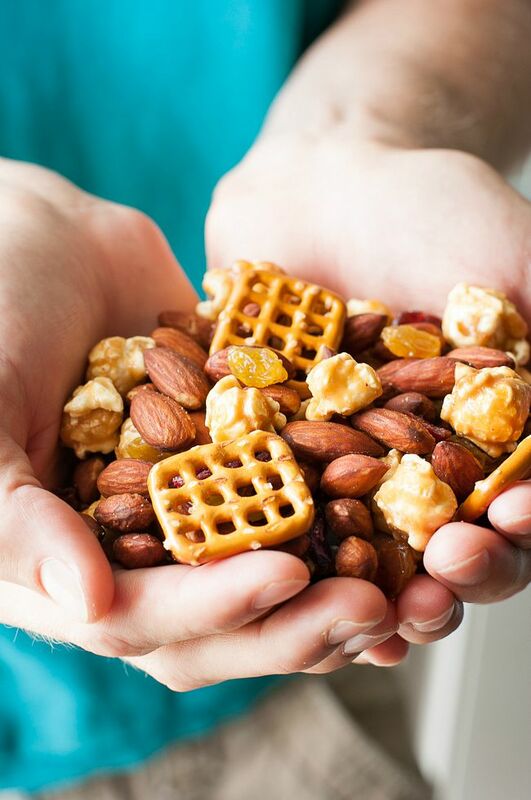 Step up your Summer snacking game with this tasty Sweet and Salty Homemade Trail Mix! Wait… what!? Monday!? That’s a week early!!! Panic set in pretty fast but was quickly replaced by sheer excitement. FLORIDA! WE’RE COMING FOR YOU! Our adventure will be starting earlier than expected and I’m totally embracing it! Though the last-minute date change threw a teeny wrench in my plan to clean out the fridge, freezer, and pantry in time for the big day, I can totally spin this in my favor. Goodbye meal prep, helloooo road trip snack prep! I kicked things off with a big ole bowl of trail mix! I would thank my hand model husband, but he ate over half of this trail mix when I wasn’t looking. That man is trouble with a capital TRUBBLE! In his defense, this stuff is a tad irresistible! I combined lightly salted almonds with super-sweet caramel corn, juicy dried fruit, and buttery pretzel snaps. This batch is totally not going to make it through the weekend let alone on the trip with us. Looks like we’ll be making more! The recipe can be followed ingredient for ingredient, or easily adapted to accommodate all your favorite trail mix add-ins. Have fun with it! Just don’t skip the caramel corn. Or the almonds. Or the pretzels. Or… you get the point! Enjoy! 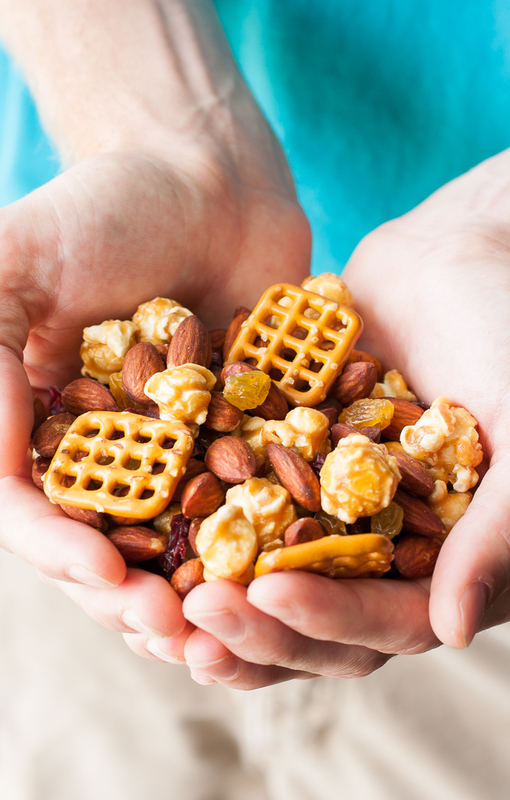 For a gloriously gluten-free snack mix, use GF pretzels in the mix and you're good to go! Deeelish! I can’t wait to hit the road, visit family and friends, and move into our new home! It should absolutely involve visiting me in Florida. I love that you added the sweet caramel corn in with the salty almonds and pretzels! This trail mix would probably be gone before we even made it to the car for a road trip! Thanks lady! <3 Yeah it's totally hard to make this stuff in advance and not scarf it all! Ohhhh trail mix is my weakness! This looks awesome! I love the sweet and salty combo. I love seeing new ideas for trail mix. I’m all about something sweet like caramel corn sneaking it’s way in there! Good luck on your move. If I was told I was moving a week earlier than planed, I would be in a dizzy panic! I’m impressed you got a post out! Thanks Rachel! 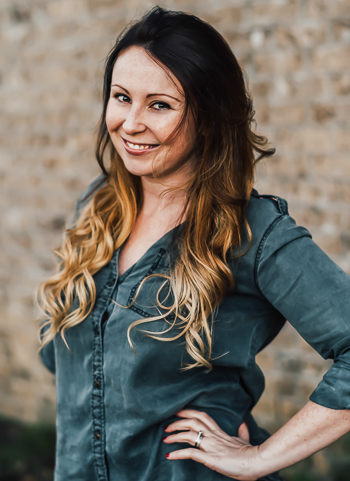 I had actually planned on posting a ton in advance and having everything all neat and scheduled for a seamless move… yeahhhhhh I failed big time! At least I got this yummy snack mix in my face! I love your inclusion of popcorn!! YUM!! JENN! omg, this looks delicious!! I’m totally making this when I go home 🙂 p.s. my “beard model” (I make a LOT of cocktails and somehow Frankie’s beard ends up in like ALL the pictures) always eats/drinks everything when I’m not looking too… it’s the WORST. Oh man…a week early? I would freak as we just moved houses and I am pretty sure if they came a week early they would be hand picking everything up and moving it as I was no where near being packed! 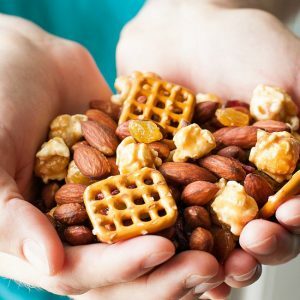 And this snack mix? I love every bit about it! They showed up even earlier than that unannounced. I almost died. 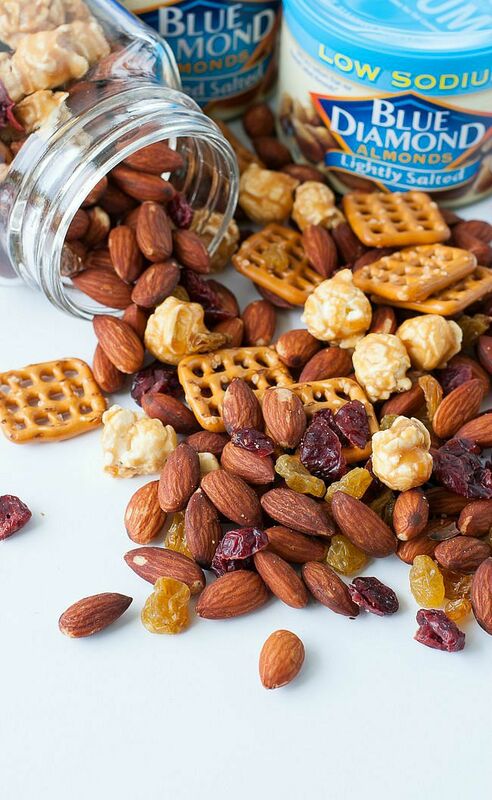 Yay for DIY trail mixes! Can I sub the caramel popcorn for salted caramel popcorn? I don’t have any non salted on hand. I could wash them first? Haha no washing needed, it’ll work great! Mmm, looks so good! Can’t beat that sweet + salty combo! This trail mix looks amazing! I hope you have a wonderful time in Florida!